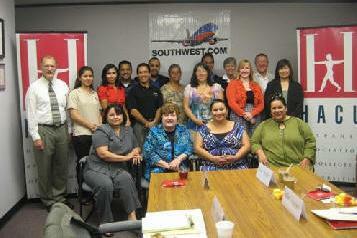 July 24, 2010 - Southwest Airlines in conjunction with the Hispanic Association of Colleges and Universities (HACU), announced today the students selected in its annual "Lanzate Take Off" education travel award program. This year's program, the theme of which is "Dandole Alas a Tu Exito Giving Flight to Your Success," started in April. More than 1,500 students from across the nation completed the online entry with a submitted essay about why they are pursuing a college degree and how the travel award would help them achieve their goals. The students were selected after intensive evaluation from a panel of judges comprised of college professors and professionals from throughout the country. The award will provide the students with one to four tickets, which the student or an immediate family member can use in the fall to travel to/from a college or university to any of the 69 cities Southwest Airlines serves. "HACU is proud to co-sponsor the Lanzate travel program with Southwest Airlines," said Antonio R. Flores, HACU President and CEO. "For the sixth year, the program has provided students studying away from home the reward of visiting with loved ones. For many students, these visits would not be possible without the support of the Lanzate travel program." Cindy Camacho : My parents have never been able to fully participate in my education. They have always been my source of strength, but their ability to be part of my education has always been limited by linguistic and financial barriers. It is difficult for me to live and study in a place my parents have never even seen. Though I can describe my college experience to them, there is always a piece missing. Enabling my parents to attend my graduation ceremony will allow them to fully become a part of my education, to share with me my successes of the past four years. The Southwest Airlines Education Travel Program enables me, for the first time, to truly share with my parents my college experience and to show them what their strength and support has allowed me to do. With more than 3,000 applicants in the last six years, "Lanzate/Take Off" is a proven successful educational program that serves underprivileged Hispanic students, providing free travel for them and their families to maximize their potential and create opportunities for growth. "Lanzate moves students not just coast to coast but from a crazy fantasy to realizing a dream of getting the first college degree in many families! It takes dedicated partners like HACU and the national education selection panel to make this journey." said Christine Ortega, Southwest Airlines Corporate Community Affairs Manager. "As a consequence, the student will have more confidence to pursue his/her dreams of higher education without worrying about the family's economic hardships," said Ortega. The Hispanic Association of Colleges and Universities (HACU) with national headquarters in San Antonio, Texas, represents approximately 450 colleges and universities, including Hispanic-Serving Institutions (HSIs), which collectively serve two-thirds of all Hispanic higher education students in the United States and Puerto Rico. After 39 years of service, Southwest Airlines continues to differentiate itself from other low fare carriers--offering a reliable product with exemplary Customer Service. Southwest Airlines is one of the nation's largest carriers. Southwest is one of the most honored airlines in the world known for its commitment to the triple bottom line of Performance, People, and Planet. Based in Dallas, Southwest currently operates more than 3,300 flights a day and has nearly 35,000 Employees systemwide.